The Good Fight is a 60 minute scripted legal television series, which kicked off on February 19, 2017, on CBS All Access and is broadcast every Sunday at . The show is currently in its 3th season. CBS All Access has officially confirmed the renewal of The Good Fight for Season 4. The exact release date is yet to be announced so far. Sign up to track it down. The Good Fight picks up one year after the events of the final broadcast episode of The Good Wife. 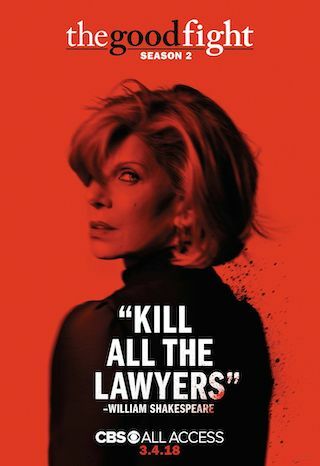 In the new series, an enormous financial scam has destroyed the reputation of a young lawyer, Maia Rindell, while simultaneously wiping out her mentor and godmother Diane Lockhart's savings. Forced out of Lockhart & Lee, they join Lucca Quinn at one of Chicago's pre-eminent law firms. May 2, 2018 -- CBS All Access today announced the third season renewal of its hit original drama series THE GOOD FIGHT. "THE GOOD FIGHT is a perfect example of what we strive for a CBS All Access original series to be: thought-provoking, boundary-pushing and, most of all, incredibly entertaining," said Julie McNamara, Executive Vice President, Original Content, CBS All Access. "We can't wait to see what Robert and Michelle King, their creative team and the incomparable cast will bring to audiences in season three."